Classical Guitar Magazine exclaims: “The maturity of musicianship and technical virtuosity …is simply outstanding.” in describing the Brasil Guitar Duo, winner of the 2006 Concert Artists Guild International Competition. With a full touring schedule on two continents, critically acclaimed recordings and innovative programming featuring a seamless blend of traditional and Brazilian works, the Duo has quickly emerged as one of the preeminent guitar duos of its generation. The Duo appears frequently in conjunction with CAG’s highly regarded New Music/New Places initiative, performing in diverse non-traditional spaces. Just some of the venues who have hosted the duo are: BAMcafé and Barbés Bar and Performance Space in Brooklyn; Long Island’s Cinema Arts Centre; Caffe Lena in Saratoga Springs; and Philadelphia’s World Café Live. 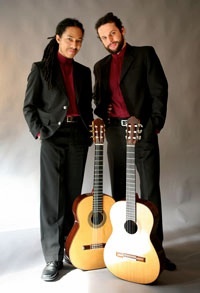 The Brasil Guitar Duo is perfectly suited for these non-traditional venues, having established a broad repertoire of classical guitar duos (Bach, Sor, Scarlatti, etc.) combined with the traditional music of its native land (samba, maxixe, choro and baião). João Luiz and Douglas Lora met in São Paulo as teenage guitar students and have been performing together for more than ten years, perfecting a sublime synchronicity and effortless performance style. The ensemble’s primary studies were with Henrique Pinto along with Fabio Zanon, Paulo Martelli, Sergio Abreu and Alice Artz. Douglas Lora recently completed a Master’s degree at the University of Miami as a student of Dr. Rene Gonzalez. João Luiz is a member of the guitar quartet Quaternaglia.